It looks like Samsung really is looking to launch an 18-inch tablet, with the large slate having just gone through the US Federal Communications Commission (FCC) this week. While an 18-inch slate hasn't quite officially been announced by Samsung, we assume it'll be the new Galaxy View, which the company teased during IFA last month. 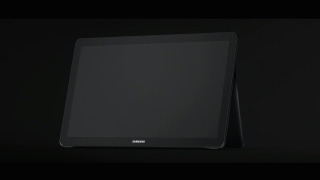 At the time, Samsung introduced the Galaxy View, shown in the image above, with a video that said, "What does it take to stay ahead? Start with the limits. Now push them. Think big. Then, think bigger." But while the company described the Galaxy View as a "whole new mobile viewing experience for a new generation," it didn't reveal much else. Spotted by Phones Arena, the FCC documents, which identifies the tablet by the model name SM-T677A, does reveal a couple of more nuggets of information, including that it sports stereo speakers and will be heading to AT&T with LTE support. According to these documents, the slate measures at 17.5 inches by 10.7 inches, with the screen measuring in at 18.6 inches. Luckily, we won't actually have to wait too long for more information, as Samsung announced during IFA that it will be revealing more details about the Galaxy View in October. Android Marshmallow release date: when can I get it?